On his first day as mayor, Jim Kenney signed five executive orders during a City Hall press conference. Mayor Michael Nutter last month revised his executive order regarding the notification of federal authorities regarding illegal immigrants in police custody. At a Monday afternoon press conference in the Mayor’s Reception Room, Kenney's executive order reverted to the policy in place before Nutter’s revision. In doing so, he noted that he’s been in discussions with officials from the federal Department of Homeland Security, who said they would reach out to local immigrant communities to address their fears about deportation and warrantless holds. “I’ve had conversations with [U.S. Secretary of Homeland Security] Jeh Johnson and his top deputy and they’ve promised to come out, sit down with the community and explain” how new ICE policies aren’t that different from the ones of old, Kenney said. After those conversations occur, Kenney said he could revisit Monday’s executive order. 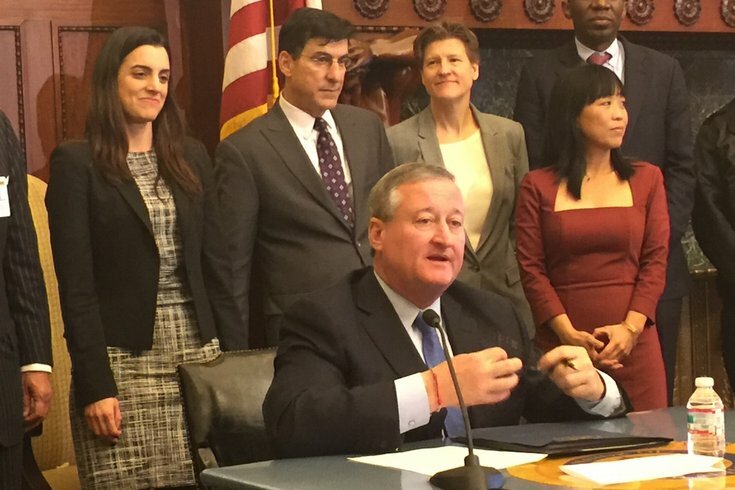 Kenney also signed executive orders establishing the position and office of Chief Diversity and Inclusion Officer, re-establishing the office of Chief Integrity Officer and creating the Offices of Planning and Development and Chief Administrative Officer. During the event, at which he was surrounded by members of City Hall’s new guard, he also announced that a Code Blue was in effect and addressed questions about protest arrests at the Mummers Parade. He also noted that John Holtz, the 28-year-old gay man who was assaulted while walking his parents’ dog near the Mummers Parade route, has filed a report with Philadelphia Police Central Detectives, who are investigating the matter.